Written by Board Certified Clinical Specialist in Women’s Health, Sarah Haag, PT, DPT. Softcover. 84 pages. Illustrated. "If you or a loved one is dealing with incontinence, you need good information and a plan that works for you. Understanding and Treating Incontinence by Dr. Sarah Haag provides up-to-date and useable evidence for therapists, physicians, and anyone looking for accurate information about incontinence. Dr. Sarah Haag has 17 years of clinical experience with incontinence and pain. She is a board certified Women’s Health Clinical Specialist and a talented therapist. I can’t think of anyone better to have written this book and will be sharing it widely to help people regain confidence and control." 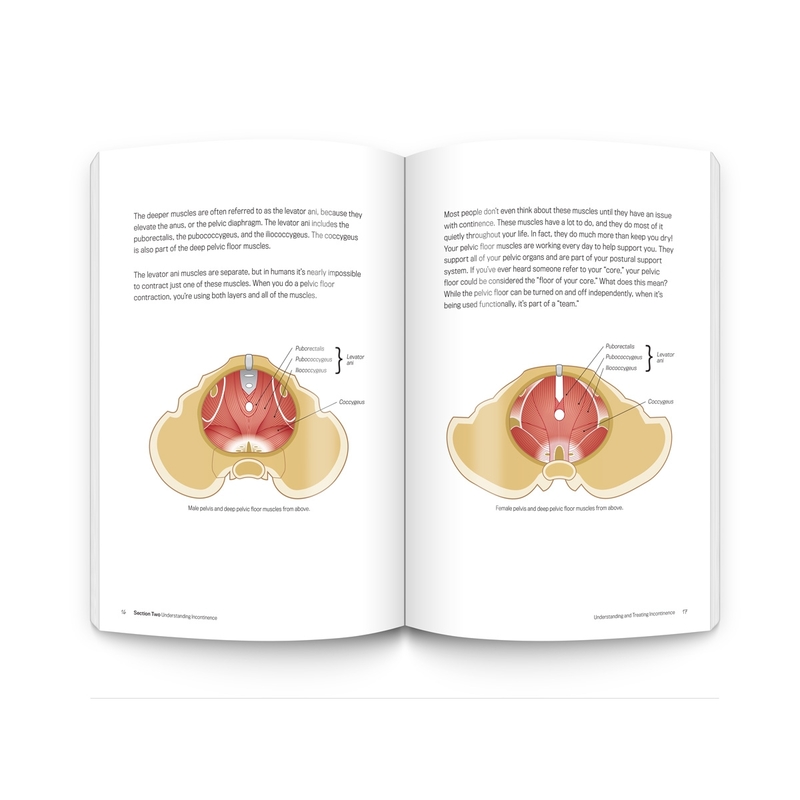 This short book on incontinence is a quick read that will teach the novice physical therapist or the person with pelvic health issues that basics of treatment options for incontinence. It gives clear descriptions of anatomy, normal and abnormal function of the pelvic floor, and lays out options for treatment of dysfunction. It would serve as a good book to have for sale at the physical therapy clinic to help the patient learn more about the role of the physical therapist in treating incontinence. A must buy for PT students, new grads, and any physio that wants to educate their patients! This is the kind of information that would be really helpful for PT students, new grads, or even seasoned physiotherapists like myself, to introduce language helpful for talking with patients. And from a patient perspective, this hits on many key concerns that I&apos;ve had people express to me about what&apos;s normal and if their issue with urinary incontinence will ever get better. The language and the wording is both informative and non-judgmental, and is written in a way that is accessible to people with various levels of education. My only recommendation for this book is to make sure it is available in other languages, especially Spanish! Great work Sarah! Thanks for helping make out profession and people&apos;s lives better!!! Dr. Haag has done a great job looking at a sensitive issue that is often overlooked by many practicing healthcare professionals, especially physical therapists. The book comprehensively discusses and easily explains the factors that cause urinary incontinence and the different ways that it can be treated. This is not only a great resource to patients, but is also a must read for student and practicing physical therapists who want to better understand the causes and treatments for urinary incontinence. It is an outstanding resource that should be in your library. End the silence and the suffering. I will have this book in the clinic library and recommend it without hesitation to my patients who are dealing with continence issues. Too many people feel they are stuck with light leakage, or give up on the things they love because of incontinence. I love that this book is written for all genders, making it a helpful resource for all people. This book has accurate information and practical ideas for self care and even better, lets people know when it is sensible to seek help. This is a helpful book for all types of clinics and professionals! Incontinence can be treated, and for many people, it can be cured!